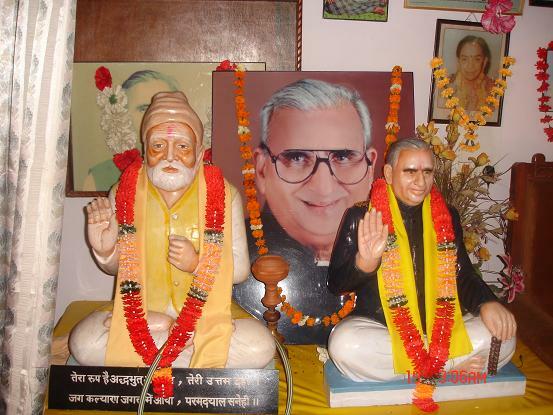 Those aspirants who have taken keen interest to see God ,to accept the truth of religion & to recognize the highest religion & who want to adopt the simplest technique of realizing god, are worthy & deserving receivers of this message. The Yoga of Light & sound. Such perfect masters engage themselves in the practice of Surat Shabad Yoga. the yoga of light. This is being practiced by listening of the infinite sound within, their eyes turned inward, fixing their attention on third eye. In such practice the practitioner brings gaze of both his eyes & elevates his consciousness by listening to certain defined sounds of the spheres. If such a saint is not available he must consult a master who preaches meditation. The association of such teachers will also improve weakness of aspirants & purify him. The next step would be to go to the refuge of perfect saint to love & serve him physically, mentally & financially in an efficient way. By serving the master, the disciple draws his attention to him. He should contemplate the face of the master for an hour or two without any distractions. Increasing the time of such practice, the effect would be to instantly purify the mind of discipline, which would eventually result in when the master imparts instructions, the disciples soul will catch the sound of the sphere. After that it is necessary for the disciple to continue the practice meticulously three/four times a day. If the mind intrudes with doubts & worries by raising unnecessary questions, one should return to master for his guidance. The master can help and make him progress gradually. Do not be disturbed & never try to hurry, but move slowly to real benefit. Whatever you do in haste or under emotions will be unstable. Haste is the work of the DEVIL. Now I shall explain the internal levels of spiritual experience which are attained by the saints. When you will turn your gaze inward to the center of your forehead, you will see open spaces, the sky, the pure self, or surat , will leave your body & sour upward. When you see the sky, you are in the region of the thousand petalled lotus (Sehastradal Kamal), where numerous patels are doing various functions of the spatio-temporal world. This region is called TRIKUTI, the triangular. It has beautiful scenes. The light is brighter than that of thousands of suns & moons of “Aum, Aum, Hoo, Hoo” & pleasant thunder of the clouds .The Surat is ecstatic with bliss & on hearing this sound becomes subtle & purified. 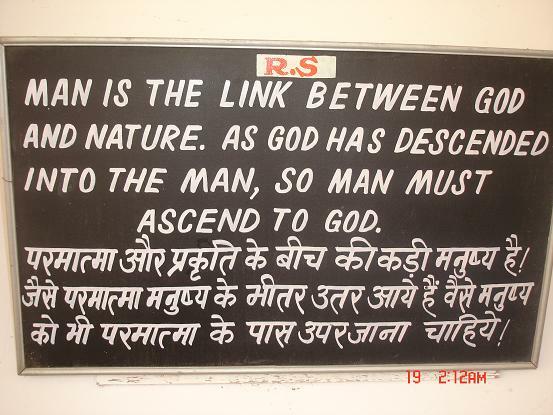 There are suggestions of spiritual consciousnesses, but after enjoying this awhile Surat soars higher & higher. As we advance further, we come across numerous palaces of glass where these pure souls enjoy all the luxuries of the palaces. Such souls are called Hansas .After this stage the soul advances further higher & higher and reaches the entrance of Mahasunn(greatervaculity),where it moves with greater pleasure. Once it reaches here, it finds the region of darkness, which may be trillions of miles beyond & downwards. Advancing further it reaches that region of Mahasunn where there are the four secret spots which have never been revealed by any saints. Many get stuck here & are deprived of the vision of the supreme master. The saints can help get pardon for these souls & take away to supreme master. The SURAT then goes even higher & reaches BHANWARGUFA where they move round & round and are surrounded by spiritual lamps and one hears the sound of “SOHAM SOHAM”.On hearing this sound the experience enriches the soul. The SURAT soars then up in the deep space (AKASH).During its upward journey Surat smeels fragrances of sandalwood and lovely aromas.On reaching the final spot one can hear the compelling sound of "SAT SAT"Here SURAT enters SATLOK and receives the vision of Supreme Lord,the SATPURSHA. The SURAT has a perception of the invisible Lord,ALAKHA PURUSHA,the brilliance of whose single hair equals hundreds of trillions of suns.Soaring higher SURAT arrives in Agama Loka ,The abode of Agam Purusha. Everything merges here into HIM who is infinite ,eternal and endless,the original abode of saints having attained which everone is silent and so am I.